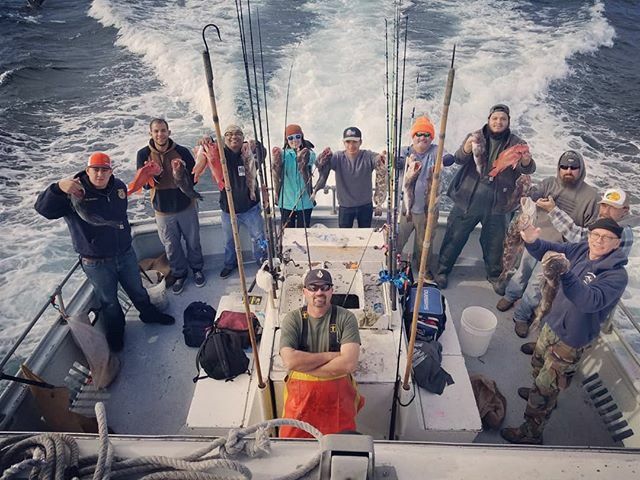 Chris' Fishing has provided the best deep sea fishing experience in Monterey Bay since 1949. Founded by Chris Arcelleo, Sr.
Information about our vessels and their captains. Recommended fishing tackle, what to wear, what is provided, schedule, etc. Check when local fishing seasons begin and end. Located on Monterey, California’s historic Fisherman’s Wharf, Chris' Fishing and Whale Watching is a full service boat chartering company that offers deep sea fishing and whale watching cruises in the Pacific Ocean waters beyond Monterey Bay. Established in the 1940’s by Captain Chris Arcoleo, Chris’ Fishing and Whale Watching has a crew of highly qualified and experienced skippers with an extensive background in the locations of hot fishing spots off the Central California coast. Whether you’re fishing for Ling Cod, Salmon or the variety of rock fish available, you’ll find deep sea fishing with Chris' to be an enjoyable experience from the time you leave the wharf until you return. Sunday, May 19th Rock Cod / Ling Cod Second Sponsored trip of the season out of #Monterey Come to Turner's Outdoorsman-Salinas 1411 N. Davis Rd. Salinas, CA 93907 or call (831) 269-7294 for reservations. Want to Check for a Spot? Did you enjoy your trip? Share your fishing trip experience or read about others. Deep Sea Cod Trips depart at 6:30 AM. Check in starts at 5:30 AM. Salmon Trips depart at 5:30 AM. Check-in time is 5:00 AM. Check in at Chris' Fishing and Whale watching, located on Fisherman's Wharf in Monterey, CA. Further direction can be found in our FAQ section.